Blog Home > Decorating > OMG! Extreme Christmas Lights! Following on from yesterday’s blog post on outdoor christmas lighting, we couldn’t resist this photo of a house (yes, there is a house in there somewhere!) which has been ‘decorated’ with lights. 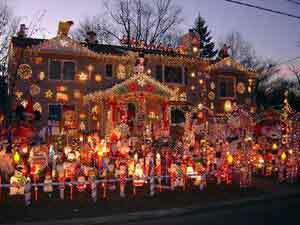 Dread to think what their electricity bill is……. Please send us any photos of your outdoor christmas decorations, or maybe your neighbour’s. You can either post them on the blog or email them to office@diydoctor.org.uk and we will put them on for you.